The Blaze Burger, without jalapeños or hot sauce. Burger Jones is supporting Burnsville’s DECA program by selling the “Blaze Burger” at it’s Burnsville location throughout the month of October. The burger inside includes cheese, bacon, egg, peanut butter, hot sauce and jalapeños. 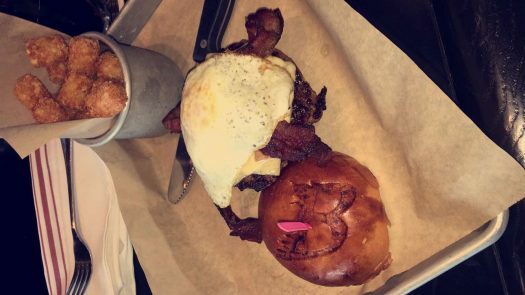 It also features the Burnsville Blaze logo burned on the top of the bun. The burger’s contents can be modified to suit your personal taste – but DECA only gets the proceeds if a Blaze Burger is ordered. The goal for DECA is to sell 400 burgers throughout the month. Burger Jones reports that around 125 burgers have been sold so far this month. If you do not want to order a Blaze Burger, you can still donate $1 to Burnsville DECA while you are there. In past years, Burger Jones has sold around 300 burgers in past years. DECA makes $1 for each burger that is sold. This, in a way, is the only real “campaign” that DECA does in the year. However, Martynow said that many other students work on projects throughout the year, such as the blood drive. “That’s the unique thing about DECA, the club has real life applications that come to fruition.” Martynow said. DECA’s mission is to prepare emerging leaders and entrepreneurs in marketing, finance, hospitality and management in high schools and colleges around the globe.